Berry hopes that Hammond will invite Mr. Louis Starr or his daughter to join the Pilgrims to see that Berry DOES still need funds. 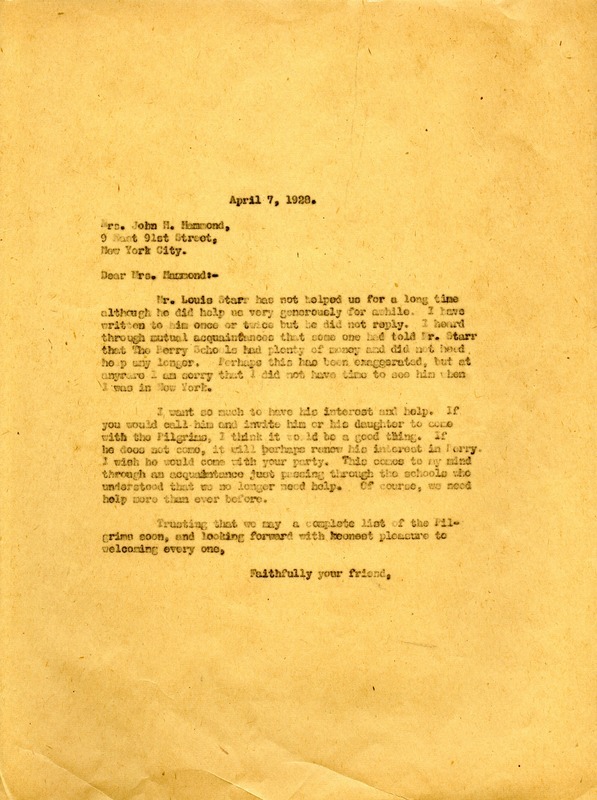 Martha Berry, “Letter to Emily Vanderbilt Hammond from Martha Berry.” Martha Berry Digital Archive. Eds. Schlitz, Stephanie A., Sherre Harrington, Chelsea Risley, Bob Williams, et al. Mount Berry: Berry College, 2012. accessed April 21, 2019, https://mbda.berry.edu/items/show/7710.